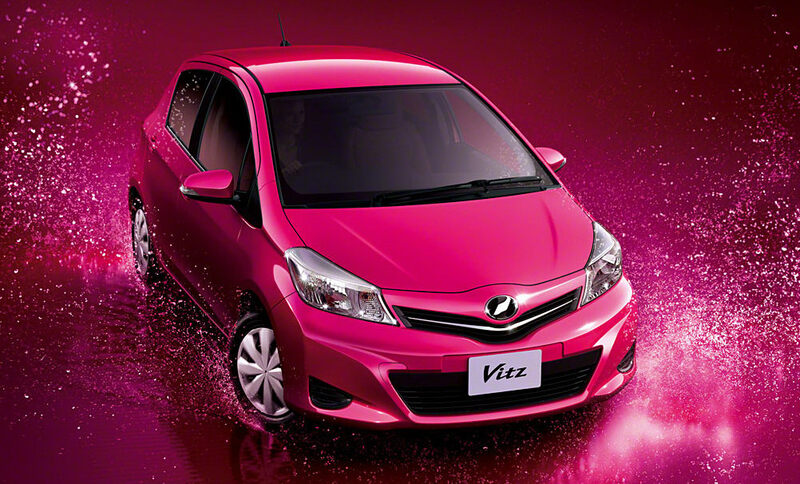 Toyota has taken the wraps of the newly designed Yaris/Vitz supermini. While these images show the Japanese domestic market (JDM) model, the European Yaris will look identical. The refreshed supermini now sports a wheelbase that is 50mm longer with the rear cabin receiving an additional 35mm of legroom. The car is 100mm longer, at 3,885mm but is 30mm shorter while retaining the same width as its predecessor. Toyota claims to have made many weight saving measures, which has taken off 30kg (66lbs), with the car weighting at 1,000kg (2,204lbs) (model dependent). Check out the photos and videos after the jump. 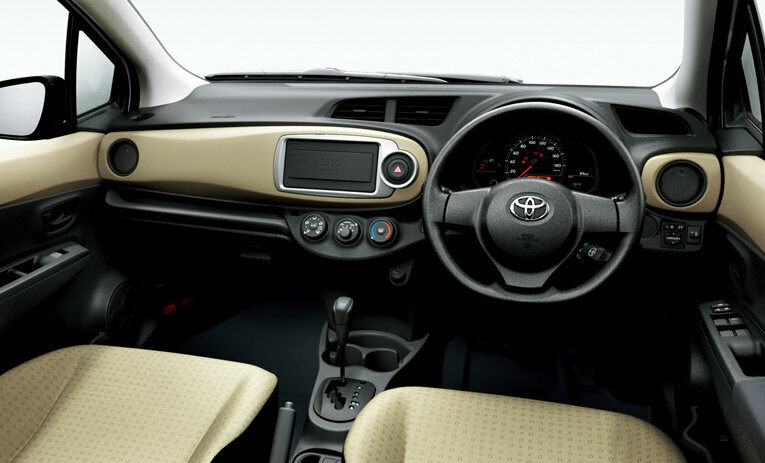 Designed to articulate agility and sophistication, the Yaris/Vitz features styling that imitates the current Toyota line-up. Thanks to the smoother exterior, Toyota is claiming a coefficient drag value of 0.285. Japanese models will obtains a variety of bodykits and alloy wheels, designed and manufactured by Toyota. Toyota says they have made major improvements to the cabin. Prominent changes include enhanced seats, higher quality materials, and big-car options like reversing camera, HDD satellite navigation and heated seats. Japanese models will be available will three petrol engines; a 1.0 litre 69bhp, 1.33 litre 95bhp and a 1.5 litre 110bhp, the latter to be used in the RS model. A stop/start will feature on the 1.33, which should return 75mpg UK/62.3mpg U.S/3.8l/100km. Four-wheel drive will also be offered. A 7-speed CVT will be standard on certain models but a 5-speed manual will be offered. Toyota is aiming to sell 10,000 units a month. 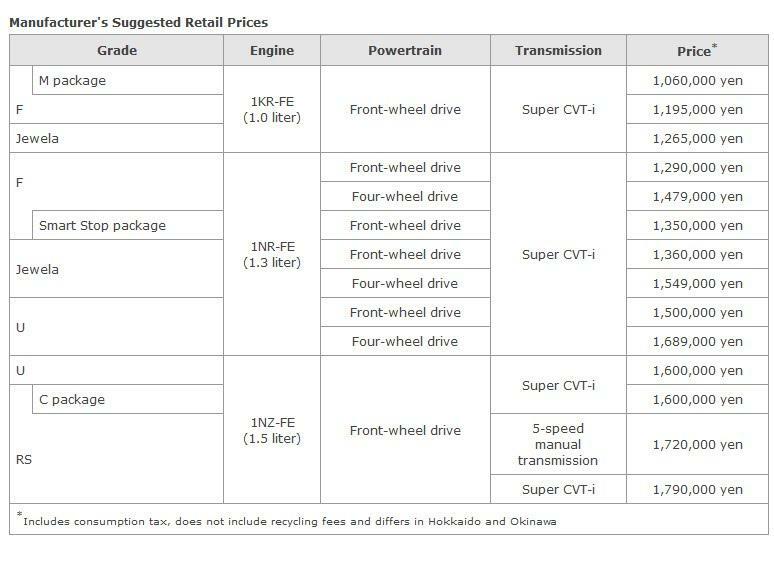 Toyota will drop its 1.4 D-4D in European models, however, the 1.5 litre is unlikely to reach European shores. A hybrid variant will arrive in 2013, with estimated CO2 emissions of 65g/km. Sales of the Yaris will start in Summer 2011 for Europe, while UK sales start in September 2011. Toyota will equip Euro-models with auto-dimming rear-view mirror, heated fronts seats, leather interior, cruise control, digital radio, rear electric windows, satellite navigation system w/reversing camera, upgraded sound system, electric-folding door mirrors and rain/light sensors to compete with class-leaders. Toyota City, Japan, December 22, 2010-Toyota Motor Corporation (TMC) announces the launch in Japan today of the redesigned "Vitz" compact car. Since the launch of the first-generation in 1999, the Vitz has achieved cumulative sales in more than 70 countries and regions around the world-including many European countries-exceeding 3.5 million units*1. With more than 1.4 million of those units*2 having been sold in Japan, the Vitz is truly a core model of the Toyota brand. The new, third-generation Vitz, developed based on a new definition of the ideal compact car to meet consumers' diversifying compact-car needs, features sharper styling as well as a compact exterior but roomy, refined interior; abundant utility; and outstanding fuel efficiency of 26.5 km/L-made possible by the Toyota Stop & Start idling-stop system-in the 10-15 test cycle of the Japanese Ministry of Land, Infrastructure, Transport and Tourism (MLIT). The result is a distinctive compact car that achieves performance equivalent to a vehicle one class higher in terms of quality, comfort, ease of use and affordability. With four grades that emphasize unique individuality, 17 body colours and four interior colours available, the Vitz is a highly appealing next-generation compact that enhances the enjoyment of choosing the perfect car and the pride of ownership. The exterior has been completely redesigned under the key design concept words of agility and sophistication. The result is a dynamism conveying the car's brisk and responsive handling as well as a sophistication expressing compact-car elegance and presence. The exterior design achieves high aerodynamic performance (coefficient drag value of 0.285), contributing to high fuel efficiency and stable high-speed cruising. The interior strives to create a form both sporty and comfortable. For example, padding that extends horizontally from the instrument panel to the door trim conveys roominess and creates a sophisticated feel. The compact length, just 3,885mm, enables a turning radius of 4.5m. The interior length has been extended by 35mm to 1,915mm, creating a roomier space. 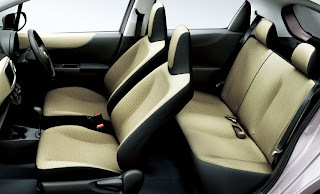 The front seats use a new frame that enhances seating comfort, and the rear seats have 35mm more legroom to create a comfortable and relaxing space in the rear. The rear seats fold in a 60:40 split, enabling flexible arrangement. The vertical adjustment range of the driver's seat is now 60mm (15mm more than the previous model) and the seat slide adjustment range is 10mm with 24 steps (8 steps more than the previous model), allowing the driver to achieve an optimal driving position. The cargo space has been made 145mm deeper, providing ample storage capacity. Also, a new adjustable deck board can be set at two heights: When set in the upper position small objects can be placed below, and folding down the rear seats can create an almost-flat luggage space. A discreet sub compartment for storing the owner's manual is located at the top of the glove compartment, expanding storage space. The passenger seat has a special plastic barrier that can be used to prevent handbags or other items from falling forward off the seat. Shopping bags and such can be hooked to the top of the barrier, which can also be used to keep an umbrella in place. The new Vitz is the first vehicle in the world to use UV-reducing glass in the front-door glass that reduces 99%*3 of ultraviolet light, providing the same level of UV protection as wearing gloves*4. The single windshield wiper works with an integrated washer nozzle that improves wiping performance. The headlights automatically turn on and off according to exterior brightness. 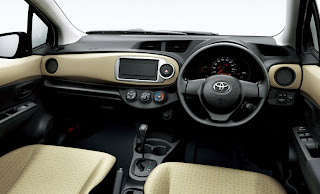 The new Vitz is equipped with a color, rearview monitor that enhances visibility when parking, as well as an HDD navigation system that incorporates steering-wheel-mounted audio-system-control switches. The Smart Stop package, featuring a new idling-stop function, mounts a 1.3-liter engine on a two-wheel drive model to achieve class-leading*5 fuel efficiency of 26.5 km/L. The engine restarts in just 0.35 seconds to ensure smooth and immediate acceleration from a stop. The 1.3-liter models are now equipped with a 1NR-FE engine with Dual VVT-i (Dual Variable Valve Timing-intelligent). Pairing with a Super CVT-i (Super Continuously Variable Transmission-intelligent) transmission achieves outstanding fuel efficiency of 24.0 km/L (two-wheel drive models) and powerful cruising. The four-wheel drive models are also equipped with Super CVT-i for smooth cruising and higher fuel efficiency. 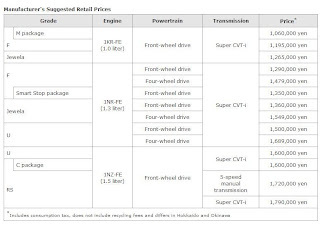 The front-wheel-drive models (with CVT) surpass the existing Japanese 2010 fuel efficiency standards by 25% and the four-wheel-drive models surpass the standards by 15%. All models in the series achieve emission levels 75% lower than the 2005 standards under MLIT's Approval System for Low-emission Vehicles, qualifying for incentives under the Japanese government's taxation system for environment friendly vehicles. As a result, the front-wheel-drive models (with CVT) qualify for a 75% reduction in the automobile acquisition tax and automobile weight tax, while the four-wheel-drive models qualify for 50% reductions. A multi-information display located within the instrument cluster shows information including fuel efficiency, average fuel efficiency and possible cruising distance. Further, an Eco Driving Indicator that turns on when the accelerator is operated in an environmentally friendly manner supports eco-driving. EBD (electronic brake-force distribution) and ABS are standard on all models. The Vitz features an omni-directional compatibility structure to provide outstanding collision safety performance in the event of a collision from the front, side or rear. All vehicles come equipped with SRS airbags for both the driver and front-passenger seats. SRS side airbags also provide chest protection, while SRS curtain-shield airbags aim to reduce head injuries. The WIL (Whiplash-injury Lessening) concept has been adopted for the front seats, adding backrest-give and head and back support for more protection in the event of a rear-end collision. A pedestrian-injury-lessening body has been adopted to minimize impact to the head and legs of pedestrians in the unfortunate event of a collision. The new and distinctive Jewela grade features exclusive body and interior colors and interior and exterior ornamentation with a plated finish to convey vibrancy. The Jewela also offers a selectable sophisticated silver-finish for the door mirrors and door handles. The F grade has specifications designed to meet a wide range of needs including price, fuel efficiency, and comfort. On the U grade, a leather-covered steering wheel and shift knob and heated seats that warm the shoulders and back are standard equipment to enhance comfort and sophistication. The sporty RS grade has exclusive designs on the front and rear, including the bumpers and a roof spoiler. Various other equipment, including exclusive sports car style seats, a steering wheel wrapped in leather with dimple stitching, and a fun-to-drive five-speed manual transmission or seven-speed Sports Sequential Shiftmatic transmission with a paddle shift-type shift lever that provides manual-transmission feel. The Lift-up Front Passenger Seat model is equipped with a front passenger seat that rotates and slides down and to the outside of the vehicle. The B type comes with a motorized device for loading and unloading a wheelchair as standard equipment. A Welcab Friendmatic model allowing for the installation of a specialized driver's seat and devices is also available. This vehicle has special power steering as a standard feature that reduces the force needed for operation compared to the base vehicle, making the steering wheel easier to turn during initial acceleration and low-speed driving.